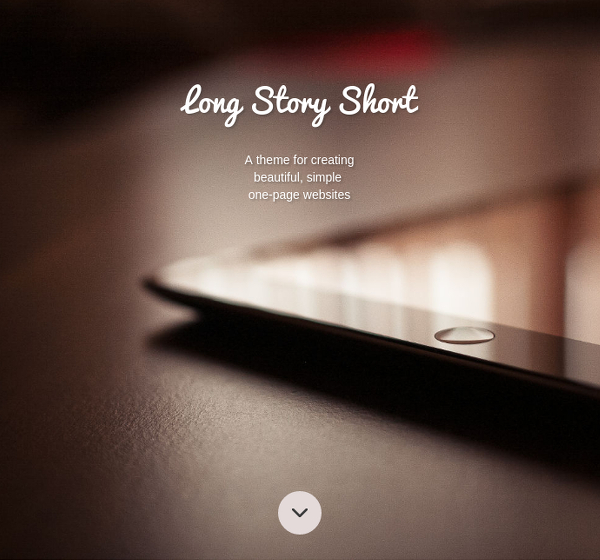 A theme for creating beautiful, simple one-page websites. Websites with parallax scrolling and full-page background images are more resource-intensive than usual websites. Be sure to test the demo with different browsers or devices to make sure that the theme meets your requirements. Also note that parallax backgrounds are disabled on mobile for performance reasons. This is not a "standard" theme: it was specially designed for one-page websites. The default template has several Slide areas, instead of having one "Main" area (as most other themes). That's why some add-ons such as Problog will not work with the default template. However, the theme includes a "Standard Page" template with a Main area. Make sure to select the "Standard Page" template in these cases or if you want to have one Main area instead of several slides. If you already have a licence of Long Story Short Parallax for Concrete 5.6, the new license will only cost you $15.